It’s official. There’s no more wondering about Steven Tyler’s position as a judge on American Idol for the show’s 12th season. Tyler has dumped that gig. 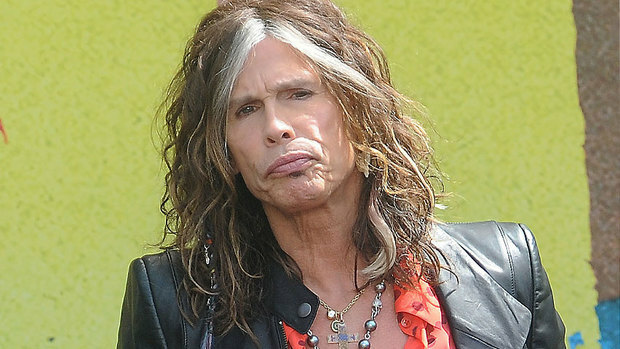 Steven Tyler has quit the show, American Idol in favour of his Rock career. After doing a two season stint as a judge on America’s once most watched show, American Idol, Steven Tyler announced on Thursday that he’s abdicating his judge’s high-paying lofty throne on AI to be back with his former band, Aerosmith. Aerosmith has been on tour this summer and has a new album coming out in the Fall. “I strayed from my first love, Aerosmith, and I’m back — but instead of begging on my hands and knees, I got two fists in the air and I’m kicking the door open with my band,” Tyler said. With Jennifer Lopez in a sort of come-back mode as well, also touring this summer with her album, she’s making sounds as though she will likely be following Tyler out the door as well. Tyler’s departure may just be the deciding factor that kicks Lopez over her rather indecisive edge. “I can’t even imagine anyone else there right now because I’ve just spent two years sitting next to him. I love Steven, and we became close during that time. We were a great support for each other, on an adventure that neither one of us knew what it was going to be. So it’s hard to hear that he won’t be doing it,” Lopez stated upon being asked about her feelings over Tyler’s news. When asked about her own return to the judge’s panel, Lopez was still sounding wishy-washy but, in reading between the lines, it’s clear to see that she’s pretty much on her way out that exit as well. Unless, of course, they offer her a sum she can’t refuse. With American Idol’s final tally of viewers bottoming out to 21.5 million, the lowest in the show’s history last season, it’s doubtful that the show will be able to even contemplate offering Lopez much more. Frankly, it may be a mistake to do so since Lopez and Tyler’s judges status weren’t able to bring up the ratings or viewership. It’s likely a safe bet that none of the judges will be back in their seats for Season 12. Even Randy Jackson would be a mistake as he’s now considered “Old American Idol” and the powers that be behind AI don’t want that image this season. In spite of Jackson’s multi-year contract with the show, there’s an escape clause that could be exercised in their contract with him if they so choose. Sadly, while Jackson is a familiar and long-time face to AI, it may be in their best interest to use it this year. With far too many talent shows on the little screen now, AI has got to come up with some unique twists and fresh ideas to keep viewers interested this year. While there will never be another Simon Cowell who can pull off the position of the judge we love to hate, AI has got to come up with entertaining judges with big names to fill those seats if it wants to stay on the air after this season. Ryan Seacrest, thank the heavens for small miracles, will still be on-board and has reportedly been showing up at the ongoing auditions this summer. Whoever fills the empty judge’s chairs has got to have charisma, be daring, bold, able to give criticisms that get the audience going, as well as be known by both the younger crowd and the older generations. They’ve got to make us want to watch them as much as the contestants. That’s why Idol worked so well with Cowell at the helm. Jackson just cannot pull that off and frankly, neither could Lopez or Tyler. It may be that Idol may have to pull some plugs in the well and open the competition up to older contestants as well. While X Factor has no age limits, AI’s advertisers are aiming towards the 18 to 49 crowd and therefore, AI has to keep the entire format of the show in line with advertiser’s wants and demands which means, keeping it appealing to that age group. Unfortunately, for AI, it isn’t just the younger crowd that watches the show. Older folks also watch it and, if they cater solely to the younger targets, bringing in teenie-bopper judges, they’ll lose the older viewers as well. Perhaps, it’s time for Idol to attempt pulling in some newer sponsors and re-market themselves by upping the age limit for competition. It works well for X Factor and America’s Got Talent so, why not give it a shot? In the meantime, it’s tempting to ask if they can pull Mick Jagger out of mothballs. Keith Richards would be a blast too. That is, if we could keep him sitting up long enough. I would add Ozzy Osbourne to the list as he’d surely be a riot but, then again…there’s something to be said about being able to understand what the judges are saying.